JANUARY 2014 • FOODSERVICE EQUIPMENT & SUPPLIES • 51 A small yet effcient kitchen supports a year-old convenience market and café and a refurbished Pizza Hut franchise at a retail unit with a long history. By Donna Boss, Contributing Editor A lfred State College's mission to bring a diverse and convenient menu and dining options to the north side of campus has been accomplished. The measure of success is a 20 percent increase in traffc at 10 Elm, an 8,316-square-foot building featuring a pair of new op- erations: 18-month-old Fresh Market and Café, and a Pizza Hut franchise refurbished 6 months ago. Together these two units offer a blend of traditional, healthful and indulgent foods and beverages, as well as comfortable seating for on-site dining. The history of 10 Elm refects a campus in transition. In the 1930s and 40s the building stood as a barn on campus. In the 1950s the building was remodeled into a bowling alley. By the early '90s, replacement parts for bowling alleys were becoming more diffcult to come by. 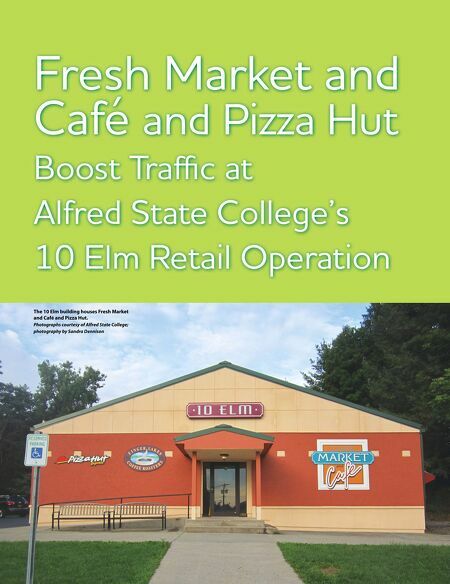 As a result, in 1996, Auxil- iary Campus Enterprises and Services (ACES), a not-for-proft corporation that also provides Alfred State's dining services, campus bookstore, transportation, vending and laundry services, ventured into its frst restaurant franchise agreement with Pizza Hut. 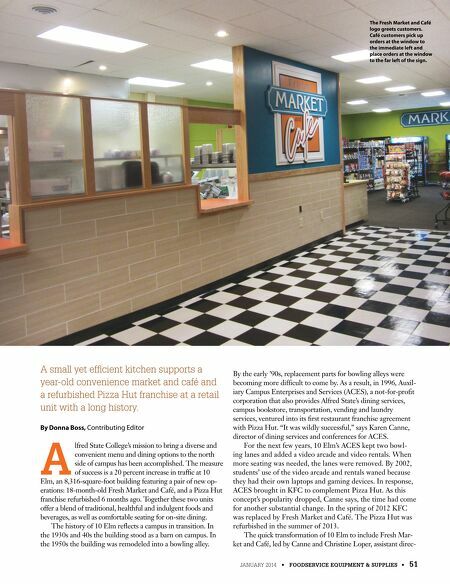 "It was wildly successful," says Karen Canne, director of dining services and conferences for ACES. For the next few years, 10 Elm's ACES kept two bowl- ing lanes and added a video arcade and video rentals. When more seating was needed, the lanes were removed. By 2002, students' use of the video arcade and rentals waned because they had their own laptops and gaming devices. In response, ACES brought in KFC to complement Pizza Hut. As this concept's popularity dropped, Canne says, the time had come for another substantial change. In the spring of 2012 KFC was replaced by Fresh Market and Café. The Pizza Hut was refurbished in the summer of 2013. The quick transformation of 10 Elm to include Fresh Mar- ket and Café, led by Canne and Christine Loper, assistant direc- The Fresh Market and Café logo greets customers. Café customers pick up orders at the window to the immediate left and place orders at the window to the far left of the sign.